Description: The game is a typical jump and run, with some other action passages, like air combat and a sequence where Crash is trapped inside a giant sphere rolling around in some sort of rollercoaster. All graphics are in 3D, and the sound is typical for cartoon games like this. The whole game is pretty straightforward in design, getting stuck on a puzzle is not really possible. 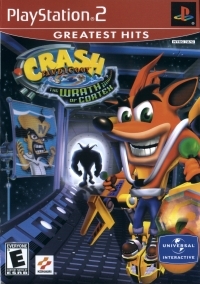 Box Text: Crash Bandicoot: The Wrath of Cortex is the first Crash Bandicoot game for a system other than the original PlayStation. The story is set some time after Warped: Dr. Cortex wants revenge after being defeated by Crash (again). For this purpose, he creates Crunch, a super-bandicoot who can destroy everything that crosses his way. 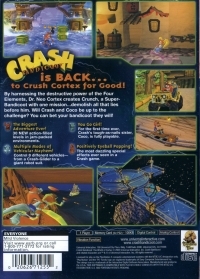 So Crash needs to defeat Crunch (and in the end, Dr. Cortex). 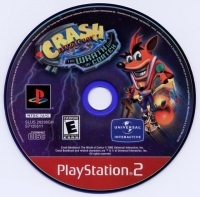 This is a list of VGCollect users who have Crash Bandicoot: The Wrath of Cortex - Greatest Hits in their Collection. This is a list of VGCollect users who have Crash Bandicoot: The Wrath of Cortex - Greatest Hits in their Sell List. This is a list of VGCollect users who have Crash Bandicoot: The Wrath of Cortex - Greatest Hits in their Wish List.